Hole in the wall takeaways at Market Lane Coffee (Carlton). Visitors to Melbourne have been drawn to the hustle of Carlton’s Little Italy since the 1950s. But locals know that the best parts of this ever-evolving neighbourhood have nothing to do with pineapple on pizza. Though no one’s going to deny that it has its tacky side, Carlton is one of those rare Melbourne precincts that just seems to keep enduring and evolving. Once you look beyond the “ciao bella” cheese of the touristy bits, you’ll find an appealing mix of traditional European timelessness, retro nostalgia and energetic, youthful vision – you just need to know where to look. When Italian migrants arrived in the area (then a Jewish enclave) post-Second World War they brought with them espresso, olive oil and a way of good living that laid the foundations for the stellar food and wine scene that Melbourne has since gained glowing international recognition for. During the 1960s, Lygon Street welcomed the city’s first coffee shops, pizza parlours and continental grocers, establishing itself as a cultural heartland for Melbourne’s Italian community and providing an education for non-Italians keen to expand their culinary vocab. While a considerable portion of the area is still made up of proudly family-run businesses that are now generations deep, the past few years have seen a new wave of entrepreneurs energising the suburb. One such business is Tony Nicolini’s D.O.C – an artisan pizzeria that opened in 2007, showing Melburnians what traditional thin crust pizza and real-deal buffalo mozzarella are all about. A long-time Carlton resident, Nicolini says the neighbourhood offers a sense of containment that few other areas in the city do. “What I love about Carlton is the intimate village feel it has,” he explains. “You’re within walking distance of the city and you’re surrounded by beautiful parks, libraries, cinemas, the museum – it’s all on our doorstep. I know people that live locally, work locally and they might visit our establishments three or four times a day. You can easily live in Carlton and have no need for a motor car – it’s almost as if there’s no need to leave the neighbourhood.” Which really just makes you want to pack your bags, sell your car and move right in. 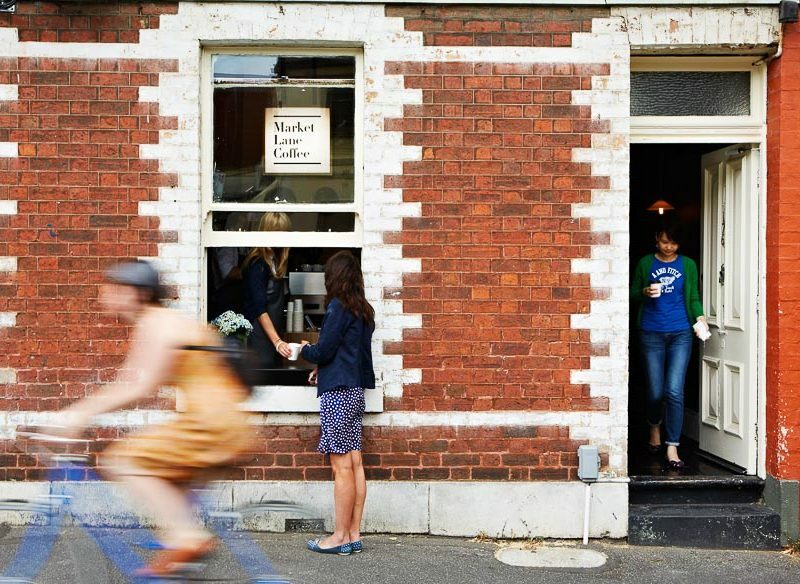 There’s a reason you’ll now find Market Lane cafes in several spots around Melbourne: its house-roasted specialty coffee is consistently excellent and considered among Melbourne’s finest, no mean feat in a town where caffeine is king. Yes, you’re in Carlton, but for now, forget old-school Italian dark roast: here it’s all about superior single origins and carefully roasted in-house blends that showcase the source. The space here is teeny tiny, so order a takeaway then pop next door to Baker D. Chirico and stock up on some of Melbourne’s best pastries and sourdough, then smuggle your haul down to nearby Carlton Gardens for a DIY picnic par excellence. Traditional authentic pizza at D.O.C Pizza & Mozzarella Bar. Come for the top-notch pizza, stay for the charming service. You’ll find mozzarella and salumi of honourable provenance plus a great Italian-leaning wine list to back it all up. Simplicity and tradition are key here, so don’t expect complicated toppings. The San Daniele with DOP buffalo mozzarella and prosciutto is a signature, while the Pizza ai Porcini with wild mushrooms, mozzarella, pecorino and truffle oil is more seductive than Sophia Loren in fishnets. Readings bookstore has been a local fixture in Carlton since 1969. Aside from the leafy lawns of nearby Carlton Gardens, there is perhaps no finer place to while away a spare Carlton hour than at this enduring Lygon Street icon. A local fixture since 1969, Readings Carlton is a well-stocked independent bookshop that has long drawn lovers of literature, film, poetry and music with regular readings, signings and in-house performances and erudite specialist staff. Don’t forget to pop next door to the amazing children’s bookstore to pick up a classic. Currently undergoing a dramatic makeover (it’s due to re-open early this year), Lygon Street’s original purveyor of continental wine, food and deli items, King & Godfree, spawned a precocious new offspring in the shape of artisan gelateria Pidapipó in 2014. Here high-quality ingredients and a gorgeous ’50s-inspired fit-out combine in a perfect, pastel-coloured love note that honours Carlton’s past. This charming corner wine bar changed hands earlier this year to welcome an all-star cast of Melbourne hospo pros – and Melbourne’s foodies are flocking. With a team that boasts long-term stints at the likes of Coda, Cutler & Co, Supernormal, Marion and Tonka, you can bet you’ll be eating – and drinking – exceptionally well here. Carlton Wine Room’s seasonal Euro-accented menu is designed to enhance the (stellar) wine offer, and staff will guide you with excellent recommendations for both. Indulge at Brunetti, with classic Italian coffee and cakes. No visit to Carlton is complete without paying homage to the brightly-lit mecca that is Brunetti. 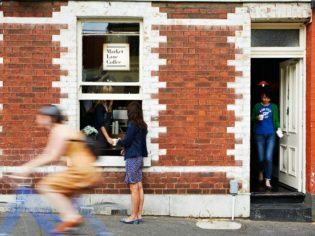 Even though there’s now a plethora of much cooler, more with-it places to drink coffee in Melbourne, this enduring staple still draws the masses – day and night, seven days a week. Much like the steps of Flinders Street Station, Brunetti has been the default meeting place for generations of uni students, blind-daters, suburban families, and anyone needing time to kill either side of seeing a film AT the Nova. Along with old-school coffee you’ll find a treasure trove of traditional Italian cakes, pastries and biscotti. Have a cocktail at the Epocha and relax on the terrace. Few Melbourne restaurants can compete with this elegant Rathdowne Street dame when it comes to looks, charm and old-fashioned good service. Owned and run by a duo of industry veterans and located in a gorgeous old Victorian-era terrace house overlooking leafy Carlton Gardens, Epocha embodies a warmth and grace not easily found these days. The Euro-accented menu favours seasonal produce and it’s here that a simple roast chicken will remind you of the great joy of simple things done well. Arrive early for a cocktail on the terrace. D. Chirio’s sourdough baked bread is some of the best in Melbourne. Known to fans simply as ‘Baker D’, Daniel Chirico is considered a god for lovers of exceptional baked goods. Following traditional methods, his sourdough breads are among Melbourne’s best and at his handsome, timber-lined Carlton outpost, there’s little chance of leaving with just a loaf of bread alone. Choose from classic French pastries and traditional Italian cannoli, bomboloni and biscotti (the pistachio and amarena cherry is a must).